Good news! Father Christmas loves his Eglu and chickens so much he has agreed to give Omlet customers exclusive use of his Sleigh Delivery service for FREE! But hurry this offer only lasts until Midnight on Sunday 6th December. 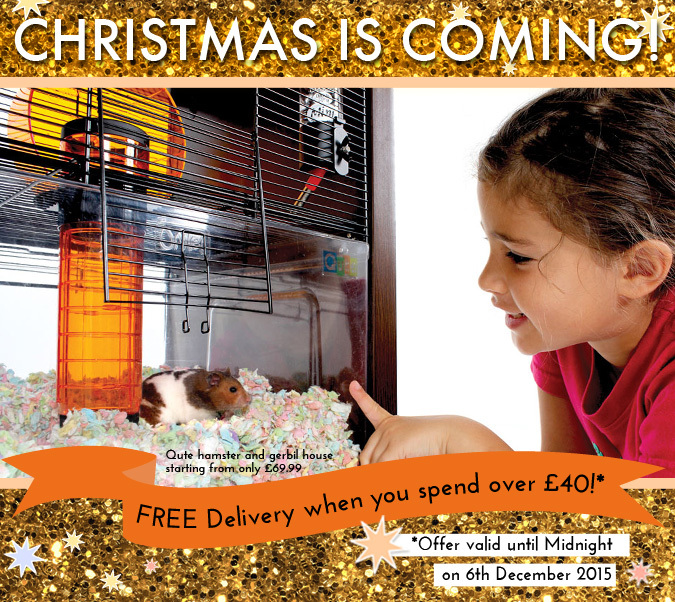 Order now to save £34.99 on a Cube with 2m Run, £5.80 on a Qute hamster house or why not put together a Christmas Hamper sized collection of covers, feed, bedding and some egg cups with the bonus of no delivery charge! Simply use Promo Code XMAS2015 to receive Free Delivery on any order over £40. This offer is not valid in conjunction with any other Omlet offer. The offer expires at 11:59pm on 6th December 2015. The cheapest delivery method will be free. Free Delivery applies to UK Mainland only. Due to expected high demand and limited space on the sleigh, your parcels might be delivered for free by Royal Mail or Parcelforce rather than Father Christmas. « Honey, I Won the Cup!